The evaluation or rating comprises three elements: firstly, an assessment of the sustainability strategies published by the companies themselves and, secondly, an assessment of the impact of production and products, including the upstream and downstream stages. Thirdly, account crossings from reliable third-party sources are identified and evaluated. On the one hand, a "positive evaluation" is carried out, which is based mainly on the data published by the companies. Companies tend to get better marks the more information they publish, the more information they give. For this reason, we draw up a controversial evaluation on the basis of media reports in order to be able to better assess the actual behaviour of the companies. On the other hand, the controversies give rise to a "negative assessment", which results in a greater deduction the more controversies are known. The third element is the impact of a company's production, services and products. Depending on the product and type of production, these can have a positive or negative effect on the final evaluation. The final score is expressed as a grade on a twelve-tier scale from A+ to D-. 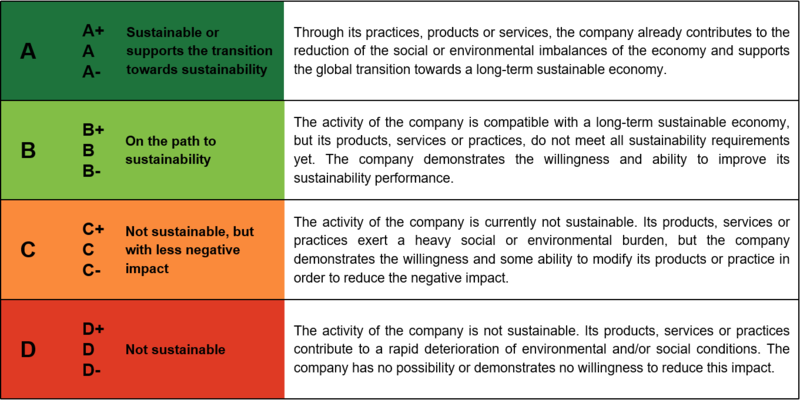 Companies rated "A" make a positive contribution to sustainable development, and those rated "D" make a negative contribution to sustainable development. We know that every industry and every company faces specific opportunities and risks. That’s why we therefore take an industry-specific view when assessing how a company manages sustainability risks and whether it takes advantage of the opportunities they present.